Don't bother with the alarm. Join the birds and sunshine outside your condo when you're good and ready - or you hear the kids shaking cereal boxes. Don't be misled by the Athletic Club's name. It does have a gym and 10 tennis courts. But the guest-magnet is the 82,000-gallon resort-style pool - kids can't get enough of the slide. The sandy-bottom wading pool is, in the words of Goldilocks, "just right." Kiahuna Golf Club is just one of a few nearby championship courses calling your name. Line up a week's worth of tee times. Once your snacks are gone and the waves have worn everyone out, you'll appreciate the easy walk back. The resort borders a prime stretch of Kiahuna Beach. There are three courses to choose from all within five minutes. The sprawling layout makes for less crowds. Plantation-style bungalows are nestled between emerald grasses and swaying palms. Castle Kiahuna Plantation & Beach Bungalows is a south shore escape, set above the ocean on a stunning white-sand swimming beach and spread out across thirty-give acres of beautiful grounds with landscaped gardens. After dropping off your bags in your condo, get changed into swimsuits, grab pool toys and water wings, apply sunscreen and head across the street to the pool at the Poipu Beach Athletic Club. Kids will have a blast on the waterslide. Kiahuna Plantation Rentals guests also receive access to the Athletic Club’s fitness center if you feel like a workout. If the weather is cooperating, take advantage of the bbq grills for a family cookout. Recruit the kids to help carry burgers, hot dogs and side-dishes. Then lay out the condiments and toppings and let everyone go to town. Or dine at the on-site restaurant & bar, Plantation Gardens. One- and two-bedroom condos are individually decorated and sleep four to six guests. Full kitchens because sometimes a mini-fridge just doesn’t cut it. Take a family field trip to Big Save Market or Sueoka Grocery Store to stock your kitchen. The kids will be begging to assist with your famous chocolate-chip cookies (and be the official taste testers). And freezers are perfect for storing dessert – popsicles for the kids (and a stash of Klondike Bars for the grown-ups). Flatscreen TVs with DVD players are perfect for family movie night. Bring favorite movies from home, pop some popcorn and call everyone into the living room. First kid on the couch gets to choose the movie. So what will it be – Cinderella or The Lion King? 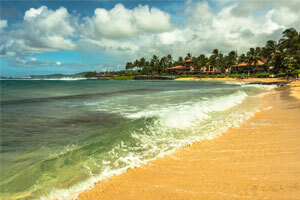 Kiahuna Beach is a short walk from Castle Kiahuna Plantation & Beach Bungalows. Set up camp on a lounge chair and supervise the kid’s sandcastle building contest. Poipu Shopping Village features a variety of shopping and dining and is just a short walk from the resort. Check out the art at Fish Eye Kauai gallery featuring work from local artists. They have everything from paintings and photography to hand painted ukuleles. Whalers General Store has all of the Hawaiian souvenirs you could possibly want. Need a new swimsuit? Making Waves has you covered. It features a large selection of swimwear. Grab a cold pressed juice at Kauai Juice Co or get your caffeine fix at Starbucks. Try a Hawaiian-style hot dog at Puka Dog. Olympic Cafe serves burgers, local fish and pasta. Vacation is the perfect time to work on your golf game. Grab your clubs and your fellow golf lovers and head to Kiahuna Golf Club for a little friendly competition. Please note: Castle Kiahuna Plantation and Outrigger Kiahuna Plantation are the same property and share facilities, but are operated by different management companies. On the sunny south side of Kauai, you’ll find three beach coves teaming with sea life, dramatic cliffs, and the ever-present monk seal.